Kansas State University’s Polytechnic Campus implemented a new initiative to engage and welcome students to the Polytechnic family: the Kansas State Polytechnic Scholarship Patrol. Inspired by the Publisher’s Clearinghouse model, a crew of enrollment management and marketing team members traveled across the state of Kansas, surprising scholarship winners at their home and work. The patrol awarded more than $228,000 in scholarships to 22 students in 13 cities. 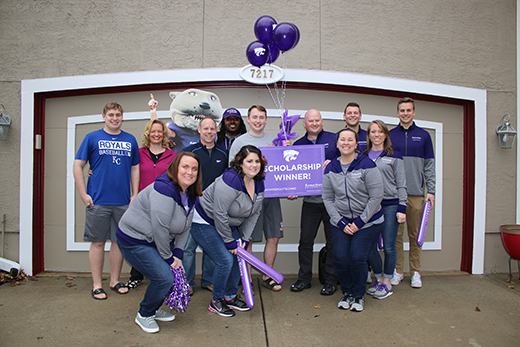 Family members and colleagues worked with Kansas State Polytechnic to schedule the stops and ensure the visits remained a surprise for scholarship winners. Stops were made in Andover, Delphos, Kansas City, Leawood, Leonardville, Manhattan, Newton, Overland Park, Salina, Shawnee, Topeka and Wichita, as well as in Kansas City, Missouri. The Kansas State Polytechnic Scholarship Patrol made its rounds on Jan. 26 and Feb. 2. In all, the 11-member patrol traveled 1,005 miles in 18.5 hours. For more about scholarships or degree options, visit polytechnic.k-state.edu/scholarships or contact the Office of Admissions at 785-826-2640.